There are 5 aprakash grahas that are calculated from the Sun, some associate them with the pancha tattvas. They are symbolic of the sin of the atma (that is why they are calculated from the Sun). They are seen as the papa purusha- the sinful side of a person. They are not planets in the western sense of the word but they are grahas in the Vedic sense as they have the power to control you, to force you to do things, and to make you think in a certain way. They are part of the upagrahas (secondary planets) as they are derived from the primary planetary positions. Specifically, the aprakash grahas are all derived from the interaction of the Sun and the zodiac of 360 degrees. Every action has an equal opposite reaction; the Sun creates Dhuma and zodiac creates Vaytīpāta which then creates Pariveña, then Indrachaapa and then Upaketu. xUmae nam mhadae;> svRkmRivnazk>. 61. Dhuma is calculated by adding four zodiacal signs and one asterism (133-20) to the longitude of Natal Sun. If we look at the Sun on Cancer Sankranti, the Sun is 0 degrees, and Dhuma is 13-20 degrees of Scorpio. When the Sun is 0 degrees Scorpio then Dhuma will be 13-20 degrees of Pisces. If we look in the natural zodiac from zero degrees Aries, this will take us to the 11 th naksatra, Purva Phalguni. Notice the number 11 which is connected to the 11 Rudras. Dhuma means smoke and is connected to the smoke after the body is burned. Ashes to ashes, dust to dust: Dhuma turns it all back. 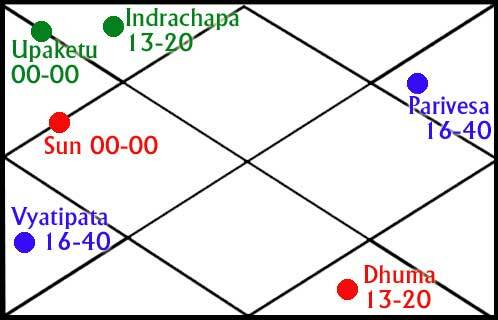 If we calculate when Dhuma is in lagna, the Sun is in the ninth house, which is after midheaven but generally the hottest part of the day. Charaka says that during mid-day the Sun becomes malefic and poisons the blood. This shows the astronomical reasoning behind the smoke of Dhuma burning things up. Dhuma can be seen as the negative burning fire of the Sun. Parasara says all work (sarvakarma) gets destroyed (vinasakah). The 8 th house from 10 th is 5 th , the 5 th house ends a karma and then begins another one; (when a person wants a new job we look at dasa/antardasa of the 5 th house). Therefore, Dhuma shows the smoke, the burnt up, the point of highest temperature. Vaytépäta is the fire of the Sun taken to the bha chakra (the zodiac). Subtract the longitude of Dhuma from 360 will give Vaytépäta: The Sun plus 133-20 is dhuma which is constantly moving with the Sun, as Sun progress the longitude of Dhuma is increasing and that of Vaytépäta is decreasing; it gives a perfect reflection. Vaytépäta is havoc, the placement of Vaytépäta will show chaos. Pariveña is exactly opposite Vaytépäta (Vaytépäta plus 180 degrees). When the Sun is 0 degrees, and Dhuma is 13-20 degrees of Scorpio, Vaytépäta is 16-40 Leo and directly opposite is Pariveña at 16-40 degrees. Pariveña means environment or circumstances; it destroys the environment or circumstances and is considered to create lots of problems (doñakåt). To really understand these aprakash grahas, plot them for the sankrantis of Sun from Cancer to Sagittarius on a North Indian Chart. Aàkaz¢haíEte papa dae;àda> Sm&ta>. 64. Indrachäpa is calculated by subtracting the position of Pariveña from 360 degrees (the deduction of Pariveña from 12 signs). If in the previous example Pariveña is at 16-40 degrees then Indrachäpa is located at 13-20 Taurus. Indrachäpa is Indra's bow, or the rainbow. Indra is the King of Heaven and the lord of rain, after his work (making it rain) he places his bow in the sky called the rainbow. This is also seen in the Old Testament where the Israelite god places down his bow after the flood to make an agreement with Noah, after he destroyed the world with rain (Genesis 9:8-11). Indrachäpa shows the bow of Indra as well as the arrows which can be piercing. Varahamihira talks in Brihat Samhita about interpretation of the rainbow in Vedic astrology. Rainbows are generally auspicious, but when you are going to battle both you and your enemy see the rainbow. When it is conjunct the lagna lord or AL it will destroy you. If it is associated with the house lord of the enemy or the A6 it will destroy the enemy. In the 3 rd or 6 th house it is in the hands of Rama, when in the 10 th and 11 th house it is in the hands of Shiva. Both placements will destroy enemies. In the 4 th house the arrows of the bow will pierce the person's own heart. Upagrahas are generally best in upacharya houses, they depend in dustanas, and other houses are generally negative, (bad only if they afflict planets in that house). Upaketu is calculated by adding 16-40 degrees to Indrachäpa. Upaketu is a secondary Ketu. It is a flame or flag or banner that will reverse whatever indications are shown. Upaketu can be connected with some very high or special person in your life dying. When one sign is added to Upaketu we arrive back at the natal position of the Sun. So the aprakash grahas are a cyclical reflection surrounding the Sun, the Atman (soul). They are showing the role of the Papa Purusha. Their calculation from the Sun/Atma also reveal that it is the soul's papa karma that is reflected into the zodiac. In puja there is a practice called Bhütaçuddhi, which is the purification of the pancha tattvas within the body to remove the blocks caused by the Papa Purusha. There are various traditions that practice Bhütaçuddhi differently. For example, Hindu pujaris do it with powerful mantras, yogis do it with pranayam and meditation on the chakras, Buddhists do it with visualization of the elements. The key is to remove these dark spots from the Atma. By purifying the panchatattvas which become indirectly controlled by the aprakash grahas when the Papa Purusha is present/uncontrolled. This allows the Sun/Atma to be in total control of the panchatattvas. This is said to give one internal purity so all mantras can work, and one can attain Brahma Jnana. The aprakash grahas are our sin/ignorance that is keeping us away from that supreme knowledge. #it xUmaiddae;a[a< iSwit> pÒasnaeidta. 65. Affliction by the aprakash grahas is determined by conjunction with the Sun, Moon, or Lagna. If Conjunct the lord of the Sun, the lineage is hurt and there may be damage to procreative abilities. This is called Brahma Sarpa. If the aprakash grahas are conjunct the Subhapati (Moon's lord), the longevity of the person is hurt, this is called Shiva Sarpa. If there is a conjunction with the Lagnesh, the wisdom (jïäna) of the person may be afflicted or the brains destroyed. This is called Visnu Sarpa. The Lagna, Sun and Moon are the tripod of life and are destroyed by the Papa Purusha. There are three levels to this type of affliction. Firs if they are in the same rasi, next if they are in the same naksatra, and third if they are in the same navamsa pada. Adridha karma is like a karma that is drawn in sand and easy to change. If the Subhapati is in the same sign as an aprakash graha then the resources for being healthy may be lacking. Unless a graha is showing otherwise, the person may not have the right type of food or vitamins to be healthy and be long lived. Dridha-adridha karma is harder to change, as if the karma is written on paper, but still possible. The person doesn't want to eat healthy or to do activities that will promote health. Dridha karma is fixed and is as if it was carved in stone, only the help of grace form god or guru can change the circumstance. If the Subhapati were in the same navamsa pada as the aprakash graha the person would not have the fortune to have a long life caused by the indicating factors. When the Sun's lord is afflicted there is a problem with progeny to carry on one's lineage. Notice the importance of AS3 and AS9 in the physical ability to have children. Aprakash grahas in the same sign will show lack of resources to have children like no marriage, or some other type of affliction. In the same naksatra the mind is afflicted and the person may not want to have children. In the same navamsa pada the bhagya is afflicted and it is not the person's good fortune to have children that will carry forth their lineage. The man has Indrachapa conjunct the lord of his Sun (Venus). Indrachapa is in the 3 rd pada of Ashwini with Venus. He is 51 and without a wife or children. His various attempts have all failed, when he has had such desires. Sometimes an aprakash graha affliction to the Sun can show up in a child's chart as an aprakash affliction to the lagna. In the Mahbharata, when the Vichitrav é rya died without leaving a son for the throne, åçi Vyasa was asked to perform niyoga with his barren wives. He asked that they do sadhana for one year before the niyoga, but Satyavat é declined as she was impatient for a successor to the King. The first born, D håtaräñöåa, was not only blind but came to be the holder of the lineage Khauravas who were known to be sinful. The wives of Päëòu, who had beeen doing austerities, gave birth to sons who were upholders of dharma. It is traditional of pious parents to perfom some type of penance for 40 days to a deity before conception to remove the Papa Purusha from one's offspring and to bring in dharmic children to this loka. Out of eight cancer cases four of them had the subhapati with aprakash grahas in the same sign. Two cases where it didn't work had the involvement of bhadakesh, the other two cases were it did not show cancer the Subhapati was Jupiter. One must remember to see the trimshamsa to see the cause and type of the disease. 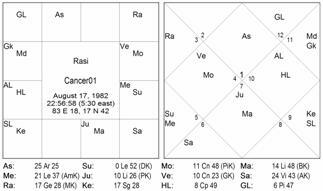 In this cancer example, the Moon was subhapati in the same naksatra as Vyatipata. Friedrich Nietzsche is a famous nihilistic philosopher and writer who went mad at the end of his life. The Rahu Moon in his lagna is more reflection of his personality, not his madness. The 5th house is related to madness yet it contains Jupiter. His lagnesh is Mars or Ketu. 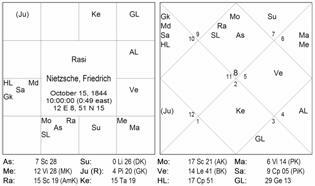 Mars is in the 3rd pada of U.Phalgni with Upaketu in the 2nd pada of the same naksatra. Ketu is in the 2nd pada of Rohini in the same navamsa pada as Vyatipada. Both cases the dhi is afflicted, which leant to his nihilistic philosphy (unable to see divine purpose) and helped him walk the road to evenutal madness. Also notice that the Venus, lord of the Sun, is in the same navamsa pada as Indrachapa. It is hard to take one out of an upagraha curse as it is hard to see, unlike the grahas which are easy to see. Sometimes mantras of Suryanarayana (the Sun in the zodiac) are used to deal with aprakash grahas as they are born of the relationship between the Sun and the zodiac. Some use specific mantras for the respective Sun, Moon and Lagna. The best mantra for the Sun is the Gyatri, the best mantra for the Moon is Mrityanajya, and the best mantra for lagna affliction is Visnu Gyatri. Otherwise there are various methods of Bhütaçuddhi that can be practiced regularly. Take in breath through left nostril saying HamsaH, hold breath and repeat the names of the tattvas. Do this three times for Brahma, Visnu and Shiva. Inhale through left nadi and hold 16 counts of YAM for Brahma in the Nabi, then inhale through the right nadi and hold 32 counts of YAM, then exhale through left nadi and kumbaka for 64 counts of YAM. The pranayam is repeated starting on the right nadi with RAM for Visnu in the heart. Repeated again starting with left nadi using VAM in the throat for Shiva. This will give you internal purity so all the mantras can work, and you get Brahma Jnana.